If you're in Athens for a few days but want to taste a little bit more of the Greek culture, then taking a day trip to the island of Aegina is perfect. It is around 30 miles offshore, and is part of the Saronic islands, and can be easily done in one day, starting early from the port of Pireaus, you can taste a little bit of island life, with a serious holiday vibe and friendly atmosphere over in Aegina. With a plethora of shops and restaurants, it is a must see if you have some spare times whilst over on mainland Greece. 1. Explore! Taking a stroll up out of the main hustle and bustle up "Leof Dimokratias" you will find a little entrance at the top of the hill to the mst incredibe view. It is a little park area, and you will see plenty of locals taking a dip along the coast line (even in October), because the water is still so mild and the temperature around 23 degrees. Before you get up to the spot, there is a famous archelogical site. You can see a lot of this from the street, but if you choose to go inside it is 3 euros per person and inside there is a cafe. It isn't the most exciting of places if you're not interested in seeing sights but everything in Greece holds a little bit of charm! Around every corner there are little chapels, and one little spot that people seemed to be taking photos near is the Tower of Markellos (pictured below). You cannot get inside, but a walk up the precarious stone steps are worth the view of the sea beyond. Take a look at the little open chapels, light a candle for a loved one, say a prayer. I can honeslty say I feel at my most religious and most spiritual when I am in Greece. In Aegina, seafood is a speciality. They have the best fish around and you can pick up fish and good seafoods at their markets. There are plenty of places to shop in Aegina, for just about everything! Remember, it is home to many locals, so anything the locals need you can find down all the little streets. Indulge in some good Greek food. We opted for Panta Rei restaurant, gorgeous sultry interior design but too nice to miss out on the sun so we sat outdoors. Good food, friendly staff and cocktails on tap if you wish! Of course it is not all seafood, plenty of restaurants if not all, sell a large variation, there are also a few amazing ice-cream bars which are well worth a visit also! This is a brilliant place to see if you love the historical parts of holidays. It lies 13km to the east of the island. A fair walk or a hop in a taxi, which you will find plenty of by the port when you arrive. 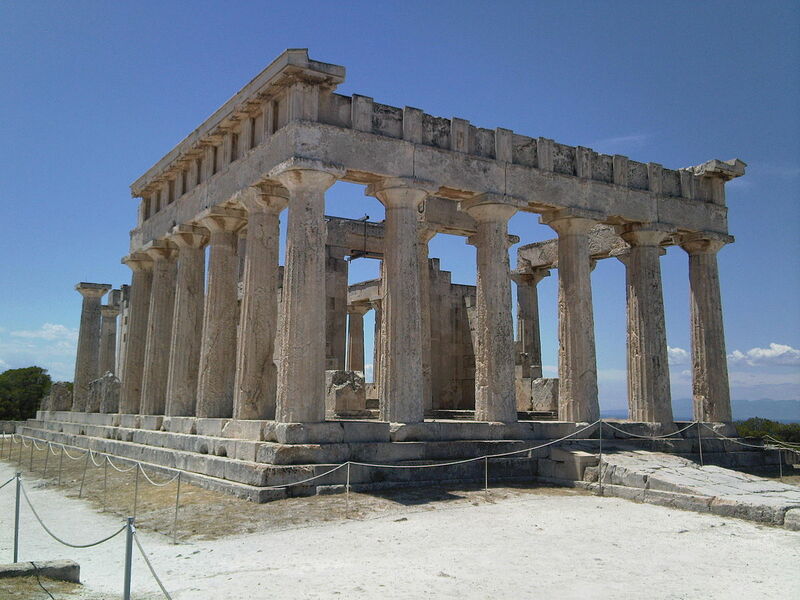 Aphaea was a Greek Goddess who worshipped at this temple and built in 500BC, it is brimming with history and certainly has a feel of the famous Acropolis. Admission is €4.00 per person and is not open on Monday. No trip would be complete without a wander along the coastline. Such stunning views, lots of privacy, never too busy, especially off season in October, it is quiet and peaceful. Dunk your feet into the cooling waters, it is fresh and salty and really perfect to sit and soak up the sea air and think. I wasn't prepared but you should be prepared to go for a swim, if this is what you enjoy. Greek waters are known for being healing, so be sure to at least get a touch of the crystal waters. Lots of unusual pebbles to be found, although not too many shells, it was worth it to bring a chunk of history home...and it was free!! As Aegina is an island, the only real way to get there is by boat. There are two options from Piraeus port, a quick speedway ferry which takes around half an hour, or the larger ferry, which takes an hour. Pleasant with a bar, cafe, and good views (although it can get very busy towards the end of the day), and the time passes quickly. It is a cheaper option, around €9.00 instead of 12. Where to book - click here to prebook any tickets and get an idea of pricing! If you want to explore the island thoroughly and spend more time there, then perhaps a weekend break could be a good choice. Take a look here for hotels in the area. It was definitely worth a trip here and felt incredibly summery, even in the autumn! If you enjoy all things Greek, take a look at the links below for more Greece related travels!